Some more comments from islanders. Chane Hernández Esto viene de muchos años atrás, desde la crisis sísmica del 2004, hemos seguido desde entonces, y en El Hierro pasó lo mismo, como ciudadana aficionada, y preocupadisima por lo que siento debajo de mis pies, quiero saber sin tapujos lo que sucede. El administrador de esta página siempre nos ha ayudado a entender y comprender lo que sucede, y hemos aprendido un millón de cosas con él. Que hay un ejambre? Acudimos a contar nuestras inquietudes y se nos explica y se nos enseña: "Señores esto sucede, puede ser por esto o por esto otro, estaremos atentos a lo que acontece y sin quitar el ojo. Aquí tienen el PEVOLCA echenle un vistazo para que sepan cómo actuar..." etc etc etc. Eso es lo que exigimos, lo que en esta página nos dan. Y doy infinitas gracias, porque por otros medios lo que tenemos ya es una hartura inmensa. This comes from many years ago, since the seismic crisis of 2004, we have followed since then, and in the iron happened the same, as an amateur citizen, and worry about what I feel under my feet, I want to know without it what Happens. The Admin of this page has always helped us understand and understand what happens, and we have learned a million things with him. What's a swarmed? We come to count our concerns and explain to us and teach us: " Gentlemen this happens, it may be for this or for this another, we will be attentive to what happens and without removing the eye. Here's the pevolca take a look to know how to act..." etc etc. That's what we demand, what on this page gives us. And I give infinite thanks, because by other means what we have is already a huge fill. Nothing updated by IGN BUT looks like there was another earthquake after the 3.2 at 12:12. Looks like earthquakes at 04:25 08:45 and 14:50 today but nothing being updated on IGN. "Desgraciadamente, por qie es una desgracia, estoy de acuerdo con Enrique,estamos sin acceso a información votal. En ninguno de los sislogramas existe una cosa tan simple como el indicativo de la energía que representa. Si a mi me pusieron un "O" en una gráfica en ña EGB por no poner uno de los datos pues. Después el acceso las estaciones. Los sismos volcánicos importantes son los pequeños, esos que se descartan. Pars más fogalera, cuando pasa la crisis de El Hierro y en la del 2004 se ponen las estaciones mas lejanas al evento, en estos momentos todos aueremos ver la estación de Vilaflor, que desde que pasan 5 km no se casi nada y a 10 km se ve poco y si bajan la sencibilidad, no se ve una poo poo..
Otro motivo de mosqueo general es el informe sísmico. Solo apare cen ciertas estaciones. Sobretodo las sordas, eas que ni detectan en condiciones un telesismo. Por lógica una estación que no detecta bien se cambia de localización. Faltan sismografos en La Gomera, Lanzarote, gran Canaria fuerteventura pero sobretodo en Cumbre Vieja. Otro punto de discrepancia con el IGN es el cambio de nomenclatura de los sismos para que no sepamos el número de registros." "Unfortunately, because it is a disgrace, I agree with Enrique, we are without access to vote information. In None of the sislogramas there is such a simple thing as the indicative of the energy it represents. If I got a "O" on a graphic in spi egb for not putting one of the data well. Then access the seasons. Important Volcanic earthquakes are the little ones, those that are discarded. Pars more fogalera, when the iron crisis passes and in the 2004 they put the stations more distant to the event, right now we all want to see the station of vilaflor, that since they pass 5 km there is almost nothing And 10 km looks little and if you drop the sensibility, you don't see number two..
Another reason for general angry is the seismic report. Just show up certain seasons. Especially the deaf, eas that do not detect in conditions a telesismo. By logic a station that does not detect well is changed from location. Missing are missing in la gomera, Lanzarote, Gran Canaria Fuerteventura but especially in old summit. Another point of discrepancy with the ign is the change of nomenclature of earthquakes so we don't know the number of records." Lo que yo pensaba, o sea la estación TBT de La Palma esta demasiado lejos de 'cumbre vieja' y no detectara sismos de poca magnitud. What I thought, either the tbt station of LA Palma is too far from 'old summit' and will not detect earthquakes of little magnitude. Could be another earthquake at 19:15. The day there is a natural emergency, the disaster is insured. Incompetence and mediocrity pure and hard by some people who are ending this institution that is the ign. Of the little located these last few days is a remarkable earthquake of 3.2 to the n of LA Palma and which will surely relocalizarán. By the way this earthquake has the data of 0.9 km deep. It has to be clear that this means, 0.9 km from the bottom of the sea, since it cannot be produced in the water (as some ign technician who needs clearly more training insists over and over again). The depth in the area exceeds 4000 meters deep, 4 km if you prefer. - clear signal at Maci at 01:52 pm - not located. - clear signal at Maci at 04:24 pm - not located. - clear signal at Maci at 04:25 pm - not located. - clear signal at Maci at 09:53 pm - not located. - weak signal at Maci at 10:39 pm - not located. - weak signal at Maci at 10:54 pm - not located. - clear signal at Maci at 11:15 pm - not located. - small seismic swarm with a dozen events from 14:158 to 14.22-not located any. - clear signal no.. the next in maci at 14:49 pm - not located (this is a shame of the fat). - clear signal at Maci at 16:38 pm - not located. - weak signal at Maci at 16:59 pm - not located. - weak signal at Maci at 18:44 pm - not located. - clear signal no.. the next in maci at 19:15 pm - not located (this is a shame of the fat again). 65 km north of the island of LA Palma. They will review. Es2019bfkhi 01/02/2019 07:08:23 07:08:23 28.0360 16.2320 2.30 km m 1.4 Mblg Atlantic-Canary Islands - 8 km southeast of the area of the volcano in the middle. The comments below have just been posted on Volcanes y Ciencia Hoy - Volcanoes and Science Today..
What if it was to happen in other islands what happened on the island of iron? Yesterday I in Tenerife felt even a little noise, accompanied by tremor, (lasted, tenths of second), as an anecdote, dogs started to bark and the cat who was in a chair noticed it too, and looked everywhere. It's not fantasy.., it's more, I wish it was!! Mike Sanz San Marta Castello told me several people at dawn... you are one of ours... welcome to the world of crazy, a greeting Marta. Loli Castañeda Marta this is... there are many people who are noticing these things, among them me. When I pass you fill the quiz. Marta Castello Hope we're crazy, so we won't be aware ? Mike Sanz San Rayco González Yihaaaaaa! Marta Castello Yesterday at pm a family member in the south, started suddenly to vibrate the coffee pot and spilled the coffee in the kitchen she ran out, said it was a ghost ?, I laugh, but ? Rayco González This is not going to stop, even less to be quiet, it will go to more. Mike Sanz San Rayco González the mower to the top.... I wrote several people at 4 in the morning that was lit the lights of the garden alone that listened to underground noises, it's more not only that person all of the house and houses Around, coincidence or causality? Rayco González The cause is clear brother, the island has the dance of San Vito and the sensitive people we are feeling it... my personal impression comes especially through my perception of the sense of balance.. Many times I feel some in worthy to report... But step.. you know with me that don't count... here I am all service to society and I will always be pending everything to be able to take a cape in whatever it takes.
" follow the earthquakes in Tenerife, one in the iron and the lack of information of the ign.- We continue almost like yesterday, without just data and only with some more located about those we had yesterday. But nature has the last word, and it will be felt clearly if we are going to have something, not only in Tenerife, but also in the neighboring islands in the form of noises, vibrations, deformations and other demonstrations that will appear in the hypothetical case In which the system is re-active before having a clear pre-Eruptive Panorama, which at the moment is not. What is there is a lot of noise in the psd, with numerous horizontal lines in the same that give faith of a lot of noise in the area. That noise at 2.75 Hz and its harmonics between 4,5 and 6 Hz could be like other times a sound of tremor in the pressurized hydrothermal system of the teide and that we have already had on other occasions when there has been a drop of Very abrupt pressure, we'll see what involcan says, since I don't expect anything from the ign, who never said anything On the other hand there are sounds at high frequencies of 14 Hz that are anthropogenic and correspond to submersible pumps or generators. As for the seismicity today, despite the signs in Maci, there is nothing in Tenerife and if we have an earthquake located in El Hierro 1 km west of the restinga at a depth of 13.9 km, in the Area where we had the lava conduit that took the magma to the area area. As for yesterday's earthquakes, in the end we have 4 Located, 3 in the interior of Tenerife and one in the area of the Volcano Enmedio without depth. Highlight a microsismo of 0.3 in the full hydrothermal system of the teide 800 m from the surface and located a little south of the area of la rambleta, where is the top of the cable car. From the rest of the days, they didn't even bother to review the graphics, what there is, is what there was.. and thank you Follow the disconnection of information to not inform and thus confuse the staff. - clear signal at Maci at 04:27 h at low frequencies - not located. - clear signal at Maci at 07:29 pm - not located. - clear signal at Maci at 09:58 pm - not located. - clear signal at Maci at 12:11 pm - not located. - clear signal at Maci at 19:35 h at low frequencies - not located. - clear signal at Maci at 19:51:30 pm - not located. - very clear signal at Maci at 19:52 pm - not located. - clear signal at Maci at 19:52:30 pm - not located. - clear signal at Maci at 19:58 pm - not located. - clear signal in Maci-01:52 h - located in deferred. - from 20:18 to 20:48 H there is no sign in the spectrogram of Maci... and instead there is an earthquake located in that time lapse. - clear signal at Maci at 23:16 pm - not located. Day.- 01/02/2019-1 located and nothing new. Es2019bfkhi 01/02/2019 07:08:23 07:08:23 28.0360 16.2320 2.30 km m 1.4 Mblg Atlantic-Canary Islands - 8 km southeast of the area of the volcano Enmedio. Looks like activity this morning but nothing updated by IGN for today. "activity on the edge of the caldera of teide del teide in Tenerife in the area of Pico Viejo, habemus data from the ign, Canary Islands, Spain.- after several days of drought in the location of earthquakes in the canary islands 6 earthquakes have been located in the central area of Tenerife island and one more on the south coast of the island about 12 km to the coast in front of the médano. A small swarm is appreciated with 3 earthquakes located between 7:14 and 7:19 between 8 and 14 km deep on the edge of the caldera, next to pico viejo and north of the teide in Where you perfectly appreciate the bolt of efforts that generate these movements that come in direction nw-SE. We have also had three more that complete the painting, the last of magnitude 1.2 to 14 km deep, at the base of the teide chamber and coinciding with the edge of the caldera of there on the road of las glens Just under the same at the height of the teide nose viewpoint. And if you think this is information, the word is no, there are many earthquakes to locate. (Enrique)"
Yesterday day 06/02/2019-7 earthquakes located. Es2019bjhmi 06/02/2019 20:03:30 20:03:30 27.9481 16.4314 -.- km m 1.8 Mblg Atlantic-Canary Islands - South of Tenerife. Neither the ign nor involcan, because all this gives rise to unfounded rumors and rumors that little or nothing have to do with reality, the truth is that we suffer an information deficiency that is causing collateral damage to all the inhabitants of the archipelago in shape Of disinformation and insecurity, which translates to the fact that tourism is recent and every time it will do more if it continues this panorama, more seeing the history of things that feel in some islands and growing with the weeks. Serve as an example of what I say, the clear concealment of information with the last earthquake of the ign, this does not appear in the catalogue of the canary islands or in the earthquake visor of the Canary Islands.. Why?... I can't answer Weird, very weird. In Case this was little, you have changed the map so you can't see where it has been exactly and have removed the phases file so you don't have any data to hold on Long live disinformation.- (Enrique)"
Earthquake Tab in the national catalogue. The link below is a live webcam link for Teide. Graphs showing possible swarm activity today Tenerife ? IGN have updated 8 earthquakes for yesterday.
" more seismic movements in the centre of Tenerife, Canary Islands, Spain.- last night we had a small swarm in the next area of Boca de tauce, next to the west edge of the caldera with a couple of events In that area located, there are 3 Clear in the sismograma and some smaller without locating. In the area of the south dorsal another notable of magnitude 1.2 in the area of arona, another one in adeje, one more than 0.9 almost just the parador in full caldera and another one yesterday of 0.6 in the area of Vilaflor. The lot is complete with several more around Tenerife, with some to the n of the volcano in the middle. The Volcano and nature follow their path, and they go little by little, but they go, waking up little by little, at the moment only small rises without importance because they do not show a clear reactivation of the volcanic system, but that make us think that this Close to occur if this one comes to produce in the medium or long term, since in short there is nothing in the horizon. Now it's time to prepare in what volcanoes refer, with those who live and that every day we see, ero once they get started, it will be late for everyone, and I hope you don't wait for the lava to come out From the earth to warn as a step in El Hierro, in this case would be a problem with consequences as much material as it could be that personal. (Enrique)"
Yesterday a small swarm La Palma. "SEISMIC SWARM IN LA Palma, many more seismic movements in the centre of Tenerife, only a few located that if, and one more in El Hierro, Canary Islands, Spain.- the thing is moved, these afternoon have State moving, and I don't say it by the earthquakes located by the ign yesterday and today in deferred, but by what it looks like in the seismograms, which says a lot of what we are living and that are making us believe. Let's go for parts. I start on the island of LA Palma, information in deferred with the part that is seen, where a small seismic swarm has occurred on 05:47-05:49 h in the morning of yesterday under the south area of the island, Specifically under the old summit volcano between 14 and 16 km of depth that the IGN HAS LOCATED 7 Events with magnitudes ranging between 1.1 and 0.7. But also you have to add that this swarm looks like the Beginning of a magma intrusion, since it has a very clear pattern in Estrella Mercedes to 120º under old summit, indicating efforts up to something.... there it is. What you don't see is almost nothing in the seismograms and spectrograms of the ign, but if you see many more signs of the localized, enough more. The Press by the way, has already been echo. Yesterday, February 12, 7 small earthquakes were located in the southern part of the island of La Palma, about 15 km deep, in an interval of 2 minutes, from 5:45 to 5: 49 (UTC), according to the National Geographic Institute. The magnitudes range from 0.7 to 1.1 MbLg and the location is in the municipality of Mazo. There is no news that these earthquakes have been felt by the population. The high density of seismic stations that the Seismic Volcanic Surveillance Network has on the island of La Palma, has made it possible to locate this activity of such low magnitude. In the area of the interior of Tenerife, an event has been located in the area of the center of caldera de guajara in the caldera of Las Glens Del Teide, with a microsismo of magnitude 0.7 and a depth of 4.4 km. The problem is that many more signs are appreciated that have not been located. From Antesdeayer we already have several revised in the caldera area. We finished the list with an earthquake of 2.1, the most magnitude east - southeast of el hierro about 15 km from the coast and 20 km deep. Of course in the spectrogram, little looks. We continue with disinformation and not information for high insecurity in the islands that produce the more economic damage better. (Enrique)." Yesterday 12/02/2019-Swarm in LA Palma. Antesdeayer day 11/02/2019-from 8 TO 7 located. At 1:10-1:11 this morning, I felt a little tremor. I've already been told that something was at that time. Virgi Mar Antonio Brito Meneses, just a second I commented on someone else, I mean, yes! Virgi Mar Chane Hernández, they were like two boats in a second, what I felt. Virgi Mar Chane Hernández, lol! I thought I'm obsessed but, q goes, it had been clearly! Virgi Mar Chane Hernández, a little while before I felt weird. If several times. Even a couple of weeks ago (I comment) I felt like when you hit a tipper stone truck... something like that to make an idea, and a deep and dry noise. And clear tremor but it all lasted like 2 seconds. And yesterday was just strong tremor, and hard a second. The graph for El Hierro today . The swarm is still continuing Tenerife. Five earthquakes already listed since midnight. Eight earthquakes listed for yesterday. "02-15-2019 (10:15) Seismic activity in Vilaflor. In the last 12 hours, 8 earthquakes of small magnitude have been located in the area near Vilaflor (Tenerife). The depths oscillate between 6 and 8 kilometers and their magnitudes between 0.6 and 1.5 MbLg and there is no news that they have been felt by the population. These earthquakes are located in the same area in which a frequent microseismic activity has been recorded since last November. The seismicity that occurred in Vilaflor is compatible with the expected activity on an active volcanic island such as Tenerife, where an annual average of 1000 small earthquakes are produced, both in its interior and in the vicinity of the island. From the IGN we remain attentive to this activity and any other that happens in the Canary Islands. In the month of January 2019, 210 earthquakes have been located in the Canary Islands. During this period, seismic activity continued between the islands of Gran Canaria and Tenerife. On the 18th at 06:36 (UTC), 14 km deep, an earthquake of 4.2 MbLg magnitude has occurred in this area, which has been felt widely in the two largest islands, reaching a maximum intensity of III (EMS92 ). The earthquake has been followed by numerous aftershocks, all of lesser magnitude. The preliminary solution of the focal mechanism of this earthquake corresponds to an inverse fault, with a high tear component and with a possible fault plane oriented in the NE-SW direction with dip to the SE. This mechanism is compatible with that obtained in its day for the magnitude 5.2 MbLg earthquake of May 9, 1989. Another point of seismic activity in this period has been located, as in the last months of 2018, in the area near Vilaflor (Tenerife). During this month, 81 earthquakes of low magnitude were located, the largest of them occurred on the 23rd at 07:33 (UTC) with a magnitude of 1.9 MbLg. In the rest of the islands, 6 earthquakes of low magnitude have been located on the island of El Hierro and 4 earthquakes on the island of La Palma. 15 km northwest of La Gomera, on day 22 at 23:09 (UTC), an earthquake of magnitude 2.8 MbLg has been located, which has been weakly felt with intensity II (EMS92) in the populations of the northwest of the island. The study of the data obtained by the GPS network during the month of January does not show significant deformations in the archipelago. Likewise, the analyzes carried out so far with the data obtained by the geochemistry and geomagnetism networks do not show significant variations in any of the parameters studied. 02-13-2019 (13:30). 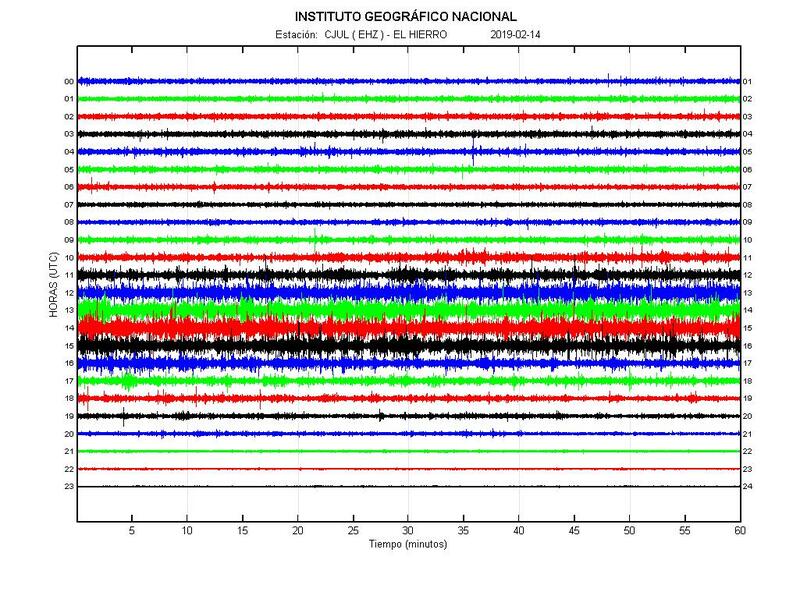 Seismic activity in La Palma. Yesterday, February 12, 7 small earthquakes were located in the southern part of the island of La Palma, about 15 km deep, in an interval of 2 minutes, from 5:45 to 5: 49 (UTC). The magnitudes range from 0.7 to 1.1 MbLg. There is no news that these earthquakes have been felt by the population. Carbon Dioxide levels still high. "SEISMIC MOVEMENTS AND MORE SEISMIC MOVEMENTS, Tenerife and more, Canary Islands, Spain. - follow the movements, and it seems that they go to more in the area of the south swarm and rising to magnitude 1.5 this morning, occurring several events, more than half dozen mainly between 6 AND 9 km deep. That is in the seismograms and spectrograms there are many more events of the localized. We must highlight an earthquake of magnitude 6.1 and a replica of magnitude 5 in the area of the Atlantic Dorsal, which in addition to appreciate perfectly in the sensors of the archipelago, both the p and s and the aquatic tertiary that comes minutes Later. It is clear that this time if the central volcanic system of Tenerife has been moved, with some seismicity a while later with some small swarms of which some events have been located in the area of the swarm of the south dorsal mainly and some event Located in the area of the caldera, specifically a microsismo from 0.7 to 12 km deep. In the report report, made by involcan the co2 gases continue to rebounding, they are already above 9 times above the normal level of background and also the temperature continues to rise in the area of the smokers where tft12 is measured ( Enrique)." Today Friday day 15/02/2019-6 at the moment. Es2019bpdgd 15/02/2019 02:39:13 02:39:13 28.0928-km m 0.8 Mblg Atlantic-Canary Islands - area of the volcano in the middle of 4 km east of the underwater volcano, between Tenerife and Gran Canaria. Today Friday day 15/02/2019-9 at the moment. Seismic Swarm on the south dorsal. Es2019bpcjh 15/02/2019 00:55:30 00:55:30 28.0177 16.2364 25 km m 1.7 Mblg Atlantic-Canary Islands - area of the volcano in the middle of 15 km to the SW of the underwater volcano, between Tenerife and Canarian. The swarm Tenerife is still continuing. It must be noted that the azimuth of these earthquakes ranges between values of 80 and 120, that is, they are due to almost vertical breakages (90) indicating a process of opening the dorsal, surely caused by dissipation Of pressure coming from below by magma that intruye or pushes from below. In addition these earthquakes are pretty well located with gap under 150, which indicate a good location by having gaps between 120 and 130, which indicates a good density of seismic sensors in that area, although it is improved of course . To These earthquakes located yesterday by the ign we have to add another two, one in the sea, approximately located 1 km from the coast of arico of magnitude 1.4 to 22 km deep and another in the volcano area In the middle, about 20 km to the SW of the underwater volcanic cone with a magnitude of 1.8 and 4 KM DEEP (regarding the bottom of the sea or topography of the land). And as we continue to happily spend the days, that wasted and ninguneados by the ign, covering the more information better, espeialmente on Saturday where more than 20 signs of clearly localized earthquakes are appreciated and some more on Sunday, I guess everything under the False belief "that the carnivals come and you can't move much that tourism but scares". What scares tourism is the lack of clear and quality information, which should supply the ign and does not do so that the more it cuts, the worse, the harder it will be the fall of the canaries for several reasons. When this cannot be covered by being meaningful on the whole island and even in the neighboring islands, there will be no solution possible. Now that it has not started, they should be watching the volcanic phenomenon in a clean and impeccable way, instead we have a shameful, corrupt, grim, mediocre, mediocre and very difficult to understand, that cuts everything that can be cut. This will make you lose all money and investments. In Italy, Hawaii, meeting or Iceland know it very well and prepare for these events minimizing the loss of eruptions, which even attract another type of tourists. Reporting is not alarm, educating in the volcanic phenomenon is to prepare for when there is an eruption, that we will like it or not and that will be in a time period that we do not know at the moment, months, years, maybe dozens of years, What will happen without any doubts coming soon, geologically speaking. (Enrique)"
Today Monday day 18/02/2019-7 at the moment. Yesterday Sunday day 17/02/2019-8 located. - and a few without locating where they are? Antesdeayer Saturday day 16/02/2019-1 located. - and many without locating where they are? Some comments in relation to the latest update by Enrique.